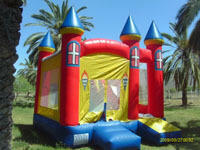 A smaller Bounce/Slide Combo perfect for the younger kids or a small family gathering. Children will enjoy bouncing, climbing and sliding in this compact inflatable. Only needs the same amount of space as a standard bounce house but double the fun! For children under 50lbs.